This year the second grade students have formed new friendships with students from Global Academy IB World School in Columbia Heights. 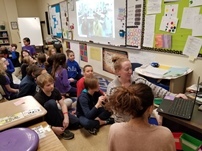 In the fall the Global Academy 2nd graders were welcomed to ISLA to share in activities related to their unit of inquiry which explored cultural similarities and differences related to traditions, language and concepts connected to weather. 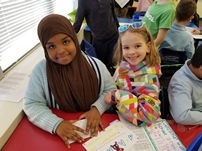 The students have been writing pen pal letters to each other throughout the year and on Monday the ISLA second graders visited Global Academy and learned about coding, sang a song in Arabic and shared their curiosities with their new friends. On Monday fifth graders had their first peek of a Catalan classroom as questions were flying back and forth in Spanish and English to their new friends at Escola Josep de Ribot i Olivas. Sra. 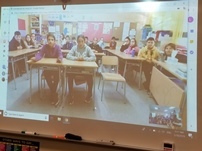 Guerrero opened the door to this cultural exchange as she had the 5th graders write letters to the 5th grade Spanish students introducing themselves and telling them about life in Minnesota. Before coming to us Sra. Guerrero worked at the Catalan school in Vilamalla on the Costa Brava, Spain. Last Friday the sixth graders had a unique opportunity to deepen their understanding of the central idea of their current unit of inquiry, “Human migration is a response to challenges, risks, and opportunity.” After inquiring into their own families’ immigrant stories and reading fictional books like “Home of the Brave” that narrates the story of a boy named Kek, a refugee from Sudan who finds himself in Minnesota, students once again stepped out of the classroom and into the community. The morning started out with a visit to Neighborhood House in West St. Paul where students were paired with English language learners from across the globe asking them questions about their life experiences and home countries. They then spent the afternoon volunteering at the International Institute of Minnesota providing,serving and sharing lunch with refugees and immigrants who have made Minnesota their home. The students spent their lunch having conversations with these students and finding all sorts of connections despite having very different life experiences. This was all made possible by generous donations from 6th grade families and collaboration between ISLA and these important community organizations. March 20 is the International Day of Happiness and this year's theme is Happier Together, focusing on what we have in common, rather than what divides us. At ISLA students celebrated by gifting a smile to someone around the world by locating a place on a world map and putting a smiley sticker on that location. The maps are hung on the common wall space by the bathrooms. They also drew and wore smiley face necklaces to help them remember to share a smile with everyone around them. The deadline for ordering yearbooks is over spring break this year (March 29th). Yearbooks will not be available after the deadline, so don’t delay! Checkout the new extra-curricular activities that ISLA will be offering for spring. Registration opens on Thursday,March 21st. Please make checks payable to ISLA PTO. The spring session will begin April 8th. To see the extra-curricular activity descriptions, click on the families tab and then extra-curricular activities. Will YOUR family be a host family next fall?Please contact Kim (kimgelp@gmail.com) or Meggin (megginoleson@yahoo.com) to talk about this opportunity. And, although our snow is FINALLY melting away, we at LA HeadQuarters never stop looking for warm items to keep our future LAs warm!!! The PTO provides the LAs with their winter gear mainly from ISLA family donations. We need men’s and women’s sizes. Smaller sizes like our older school kids would wear (girls size 14-16) are always needed. Please leave donations with Emily Smith in the front office. Please contact Meggin (megginoleson@yahoo.com) with any questions regarding donations. Hola Parents! Your input is very important us! If you haven’t had a chance to complete the PTO survey (placed on classroom tables at conferences), complete online by March 31, 2019 for your chance to win 2 FREE TICKETS TO THE FIESTA DE LA PRIMAVERA! Parents! We are looking for donations for our 12th Annual Fiesta de la Primavera auction scheduled for May 4, at Plymouth Creek Center in Plymouth. WE ARE OPEN TO ALL TYPES OF DONATIONS SO BE CREATIVE! (You choose how many spots for your event, during the Fiesta auction parents/students sign-up & pay per spot, bringing forth community and raising funds to benefit our LA Program). Last minute donations will be accepted for one more week! Contact Merrie Sjogren merriesjogren@gmail.com for questions! : You can find your child’s things easily in the lost and found by marking them with bright, durable, Mabel’s Labels. Go to https://campaigns.mabelslabels.com/ and click on Select your School/Organization and choose InternationalSpanish Language Academy. A portion of your purchase will support the PTO. : Shop at Amazon? You can have a portion of your purchase donated to the PTO! Go to https://smile.amazon.com/ and search for International Spanish Language Academy. Then just make sure to bookmark Amazon Smile and use it for your entire Amazon shopping needs. The PTO collects and organizes new or gently used uniforms that are donated by ISLA families who no longer need them. They will beset out at a variety of events throughout the year. However, if you find your child has gone through a growth spurt and you need access to them sooner Emily is able to give parents access to where the uniforms are stored. To donate items, please bag them and drop off at the school office. Please feel free to take any items your kids could use. You do NOT have to donate anything in order to take.